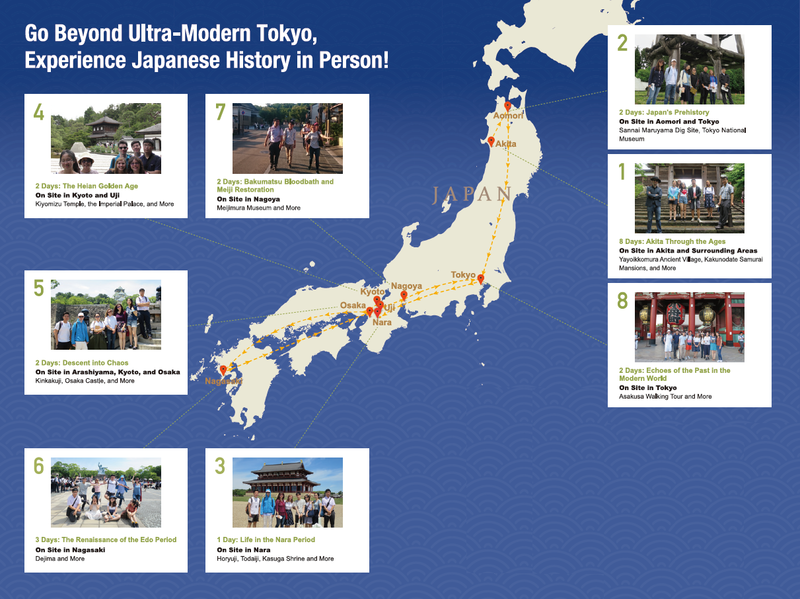 Once Upon a Time in Japan is a unique, intensive Japanese history seminar that takes students to over 40 historical sites in 10 cities over three weeks. On-site at Osaka Castle in 2017. Students travel from Aomori in the north to Nagasaki in the south while also traveling from Jomon prehistory forward in time to World War II. 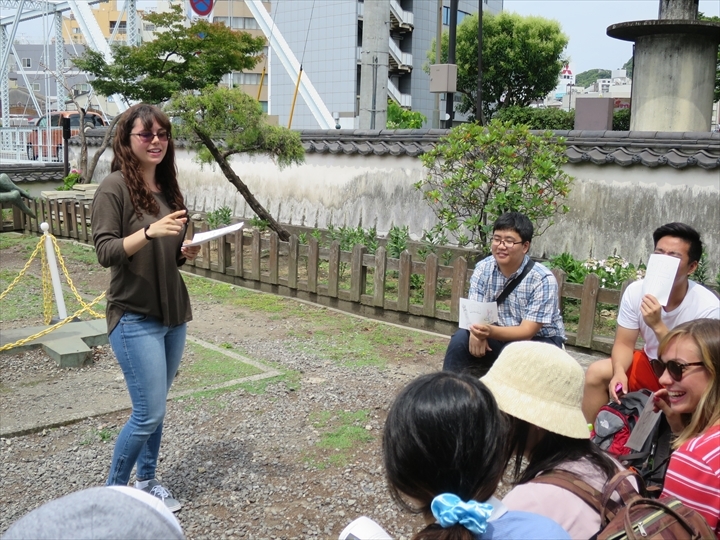 At each site, students take part in English-language, on-site lectures and discussions about the sites' historical roles, deepening their understanding of Japanese history and reinforcing their lessons with personal experience. No Japanese language ability required! The course contents are taught entirely in English and the program includes survival Japanese lessons to help students in their travels. This program introduces some of the most important events in Japanese history, from Jomon prehistory up to Japan's emergence in 1869 as a modernizing nation on the world stage, before extending into the Meiji period and the seeds of Japan's defeat in World War II. 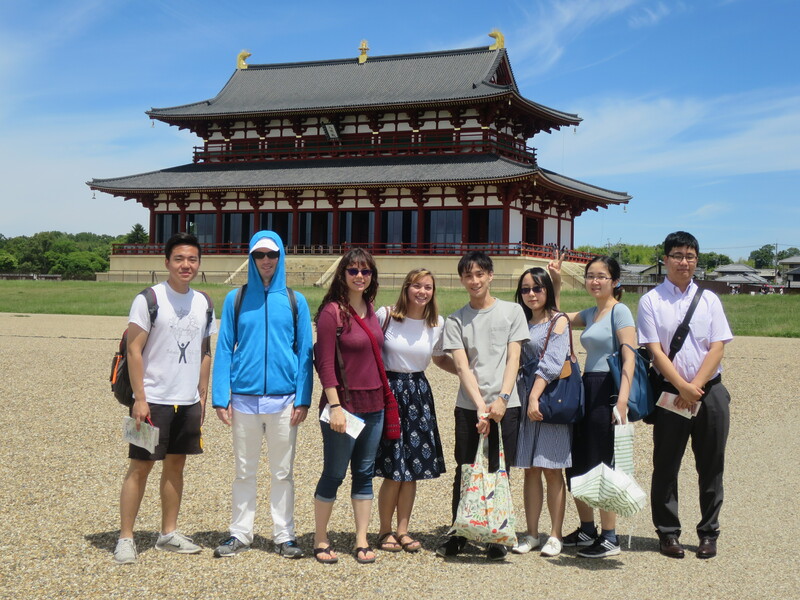 Senshu Park and the Kubota Castle ruins in Akita: One of the first site visits of the program. 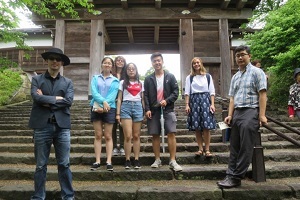 Students spend their first nine days at Akita International University, where they join lectures with AIU students, participate in coursework specific to this program, and take part in four excursions to six historical sites around the prefecture. The remaining two weeks of the program takes students to 8 cities in 14 days, with each visit themed around a particular historical time period, moving forward in history as they traverse the country. Reconstructed Heijo-kyo palace in Nara. During the traveling portion of the program, students take part in on-site discussions and exercise based on the particular historical significance of the various sites. The program instructor supplies the background to a specific event and students take on the roles of key players, deciding how they could respond to their situation. After the discussion, students and faculty tour the site then move on to their next destination. 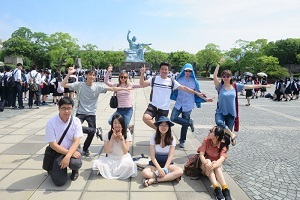 Travel time, often including significant walking distances, as well as meals together with classmates, faculty, and teaching assistant (TA) offers additional time for follow-up and digging deeper on topics of interest. Participants stay in hotels in each of the cities and evenings are an opportunity to complete daily journaling assignments, rest from the day's exertions, or, for the adventurous, to get out to see more of their city of the day! Once Upon a Time is an active course, with some days including more than 10 km of walking! Walking from site to site gives time for students to follow-up one-on-one on individual interests and lingering questions. The program is taught entirely in English and there is no Japanese language requirement to participate. However, since you will be traveling around the country, there will be constant opportunities to practice Japanese language, from ordering food at restaurants to reading display descriptions during site visits. 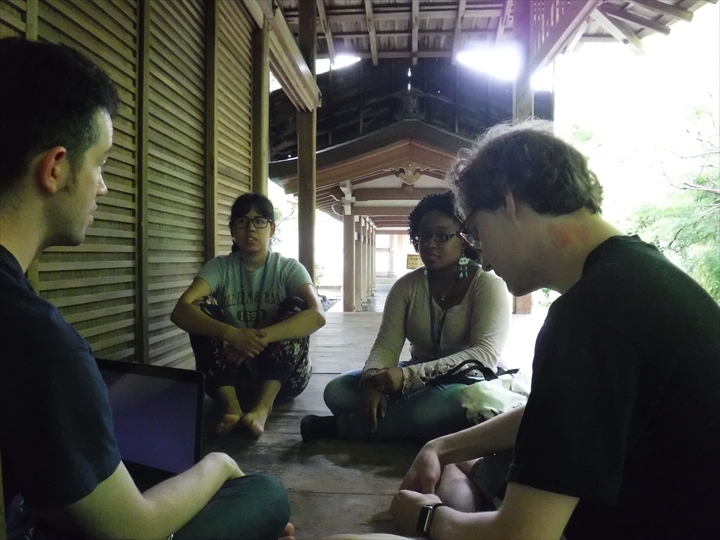 To help participants with survival Japanese and getting around, there will be multiple Japanese language instruction sessions during the week at AIU, as well. 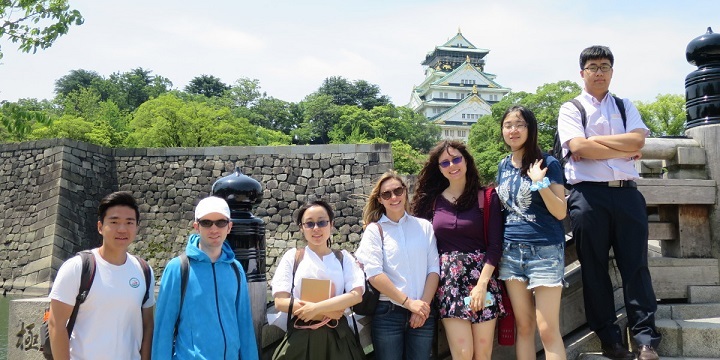 JAS 390 Once Upon a Time in Japan: Traveling Seminar in Japanese History is an advanced Japanese history course with over 90 hours of instruction worth six AIU credits. All participating students will receive an official transcript sent to their home institution after the conclusion of the program. There are no prerequisites for this course, other than an inquisitive disposition and excitement to learn more about Japanese history in person! To get a better understanding of the program, read about the 2017 inaugural program here. Program Dates: Monday, May 27 - Tuesday, June 18. There are two free days during the program, but other than that you will be engaged in activities, lectures, and site visits every day - weekends included - to make the most of your time. Download the detailed syllabus here. This is a small, intensive program that will maximize your participation and interaction with your classmates, TA, and faculty supervisor as you travel together around the country. 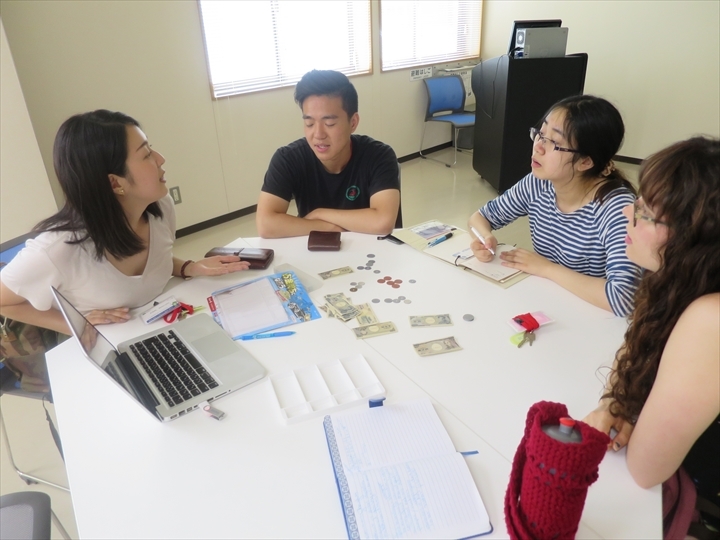 Program participants live in Komachi Residence Hall with AIU degree-seeking students as roommates during their time at AIU. During the traveling portion of the program, all participants will stay in hotels arranged by AIU. Lodging fees are included in the program cost. 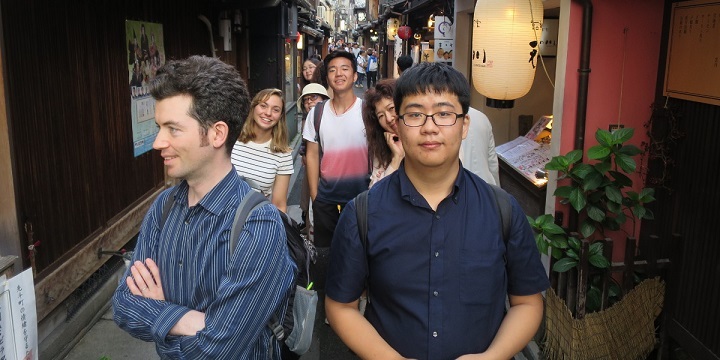 Even during the relatively "slow" first week in Akita, you will have six site visits over nine days, plus join classes on campus. Once you board the shinkansen to leave Akita, you will be on the move for the remainder of the program with up to five site visits per day. Be sure to bring comfortable walking shoes! Nagasaki Peace Park: The most southern - and historically recent - destination of the program. AIU established Once Upon a Time in cooperation with The College of William and Mary (USA) for the first iteration in 2017. Since 2018, AIU expanded participation in the program to selected participating universities. Each day's visits are clustered around a specific period in history and, as you travel from north to south across Japan, you will also travel forward in time from Jomon prehistory at the Sannai Maruyama dig site all the way to World War II, the atomic bomb in Nagasaki, and peace museums.